AK47.CAPITAL - ak47.capital | Slivsell - Библиотека курсов. Лучший слив инфопродуктов в России! Тема в разделе "HYIP от 61% в месяц", создана пользователем naale, 5 мар 2018. Мы профессиональные трейдеры, которые сформировали команду в 2007 году задолго до того, как была обнаружена криптовалюта. Мы получали бесценный торговый опыт на Форексе, но после появления криптовалютного рынка мы решили выйти на новый уровень в сфере биржевой торговли. Итак, начиная с 2014 года наша команда начала продвигаться в криптографической торговле. Сначала у нас было много сбоев, так как криптовалютный рынок не был таким же, как и обычный рынок финансовых активов, из-за его волатильности и других особенностей. Однако через 2 года мы не только вернули все наши средства, потраченные на получение опыта в области криптовалютной торговли, но увеличили вложенные средства более чем в 20 раз, исключая рост криптовалюты. Идея AK47.CAPITAL - это ассоциация с «валютным пулемётом». Наш «валютный пулемет» позволяет каждому не только «стрелять» в доллары, биткойны, литеки и / или эфир, но и делать это максимально удобно! Все, что вам нужно, это выбрать инвестиционный план, указать сумму инвестиций и реквизитов для выплаты дивидендов и, наконец, оплатить счет. 05.03.18 09:01 Transfer Sent Payment: 170.00 USD to account U10002051 from U1294xxx. Batch: ‎207399867. Memo: Shopping Cart Payment. mail@all-hyips.info AK-47/1520240545. картинка с "Saint Row 3" игрухи, название ак47 - при чем тут ! Слепили из того что было, А с таким планом почти месяц деп только отбивать, не считая что праздники уже скоро и моников что то начал усиленно скупать - для плавности старта. Memo: API Payment. AK47 daily payout for deposit USD500, payout 1/50. Thank you!.. The amount of 70 USD has been deposited to your account. Memo: API Payment. Referral Payment of UXXXXXX.. The amount of 50.1 USD has been deposited to your account. Memo: API Payment. Referral Payment of XXXXXX.. The amount of 138.8 USD has been deposited to your account. The amount of 35 USD has been deposited to your account. The amount of 80 USD has been deposited to your account. The amount of 58.52 USD has been deposited to your account. Memo: API Payment. Referral Payment of 1XXXXXXXXXXXXXXXXXXXXXXXXXX7.. The amount of 200 USD has been deposited to your account. Memo: API Payment. Referral Payment of UXXXXXXX.. The amount of 8.9 USD has been deposited to your account. Memo: API Payment. AK47 daily payout for deposit USD500, payout 2/50. Thank you!.. The amount of 50 USD has been withdrawn from your account. Accounts: U3669097->U10002051. Memo: Shopping Cart Payment. AK-47/1520344562.. Date: 13:55 06.03.18. Batch: 207549885. The amount of 2 USD has been deposited to your account. Accounts: U8501575->U3669097. Memo: API Payment. AK47 daily payout for deposit USD50, payout 1/50. Thank you!.. Date: 04:14 07.03.18. Batch: 207615214. Memo: API Payment. AK47 daily payout for deposit USD500, payout 3/50. Thank you!.. The amount of 40 USD has been deposited to your account. Memo: API Payment. Referral Payment of XXXXXXXXXXXXXXXXXXX.. Memo: API Payment. Referral Payment of XXXXXXXXXXXXXXXXXXXXXX.. The amount of 2 USD has been deposited to your account. Accounts: U8501575->U3669097. Memo: API Payment. AK47 daily payout for deposit USD50, payout 2/50. Thank you!.. Date: 04:03 08.03.18. Batch: 207720800. The amount of 5 USD has been deposited to your account. Accounts: U8501575->U3669097. Memo: API Payment. Referral Payment of U329.. Date: 03:28 09.03.18. Batch: 207815100. The amount of 2 USD has been deposited to your account. Accounts: U8501575->U3669097. Memo: API Payment. AK47 daily shot for deposit USD50, payout 3/50. Thank you!.. Date: 03:35 09.03.18. Batch: 207815864. Memo: API Payment. AK47 daily shot for deposit USD500, payout 5/50. Thank you!.. The amount of 50 USD has been withdrawn from your account. Accounts: U1136717->U10002051. Memo: Shopping Cart Payment. AK-47/1520851540.. Date: 10:44 12.03.18. Batch: 208103270. Memo: API Payment. AK47 daily shot for deposit USD500, payout 6/50. Thank you!.. The amount of 2 USD has been deposited to your account. Accounts: U8501575->U3669097. Memo: API Payment. AK47 daily shot for deposit USD50, payout 4/50. Thank you!.. Date: 04:58 12.03.18. Batch: 208072612. The amount of 2 USD has been deposited to your account. Accounts: U8501575->U1136717. Memo: API Payment. AK47 daily shot for deposit USD50, payout 1/50. Thank you!.. Date: 05:02 13.03.18. Batch: 208185039. The amount of 2 USD has been deposited to your account. Accounts: U8501575->U3669097. Memo: API Payment. AK47 daily shot for deposit USD50, payout 5/50. Thank you!.. Date: 04:54 13.03.18. Batch: 208183883. The amount of 2 USD has been deposited to your account. Accounts: U8501575->U1136717. Memo: API Payment. AK47 daily shot for deposit USD50, payout 2/50. Thank you!.. Date: 05:06 14.03.18. Batch: 208296738. Не ведитесь, трейдинг это рано или поздно слив своих денег! The amount of 2 USD has been deposited to your account. Accounts: U8501575->U3669097. Memo: API Payment. AK47 daily shot for deposit USD50, payout 6/50. Thank you!.. Date: 04:58 14.03.18. Batch: 208295833. 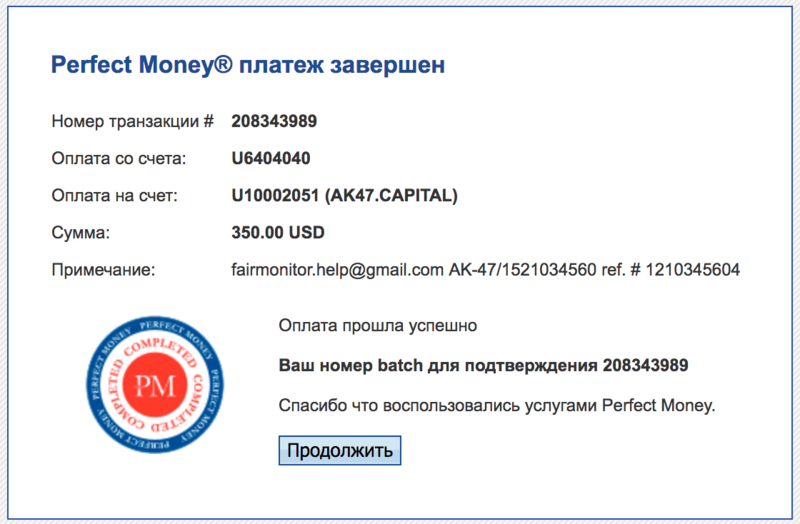 Memo: AK47 daily shot for deposit USD20, payout 1/50. The amount of 2 USD has been deposited to your account. Accounts: U8501575->U1136717. Memo: API Payment. AK47 daily shot for deposit USD50, payout 3/50. Thank you!.. Date: 04:37 15.03.18. Batch: 208405077. The amount of 2 USD has been deposited to your account. Accounts: U8501575->U3669097. Memo: API Payment. AK47 daily shot for deposit USD50, payout 7/50. Thank you!.. Date: 04:30 15.03.18. Batch: 208404187.